For this second day of the Jeanne Du Prau blog book tour I have got an interview for you to look at. 1. What, if any, was the inspiration for the idea of a city underground? I grew up in the 1950s, when many people were worried that there might be a nuclear war. Some people were even building bomb shelters in their back yards. I used to read magazine articles with instructions about how to do this. All of it made a huge impression on me, and there's no doubt that it influenced my idea for Ember, which is a place built to save the human race from a terrible threat. 2. The Prophet of Yonwood takes a big step back in time from The City of Ember. Did you find it hard to make this step in the writing process or was the transition an easy one to make? When the idea for The Prophet of Yonwood first came to me, I thought it was going to be a separate book, not connected to the Ember series. But as I started writing it, I soon realized that it was connected after all. It was a story about fear and unreasoning belief and what can happen when people see their own side as absolutely right and all others as absolutely wrong. It was a story about the origins of conflict, in other words--the kind of conflict that can lead to a disastrous war, and it was that sort of war that led to the building of Ember. 3. In the Diamond of Darkhold the diamonds that Lina and Doon find end up being crucial for the people of Sparks. Where did you get the idea for the diamonds, and do you feel that there is an environmental message here regarding solar power? I have been interested in solar power for a long time. I'm hoping we will find a way--soon!--to use it efficiently for all our energy needs. Twenty years ago, I built a small house powered entirely by photovoltaic panels. It was a wonderful feeling to know that my lights, my refrigerator, and my computer were all being run by the sun! So of course I'd like others to share my enthusiasm. 4. At the end of The diamond of Darkhold you mention that a space ship has come from an alien world to visit Earth. This sounds intriguing and I for one would love to know what happens next. Do you plan on writing about this story in a future book? I don't think so. I too would love to know what might happen in an encounter between human beings and people from another planet. But it isn't easy to create a convincing alien in a story. I've rarely seen it done. What I'd really like is to live long enough to be here in this world when we make contact with intelligent beings elsewhere in the universe. That would be an unimaginable thrill. 5. In writing these books were you trying to get young people to think about the future of our planet? I did not start out, when I wrote The City of Ember, to deliver that message. But I myself am thinking about the future of our planet, and so that concern naturally shows up in what I write. 6. Do you plan out your books in advance or do you just let the story unfold as you go? A little of both. I make a rough plan and write according to the plan until I see that it doesn't work any more, that the story has taken a new direction. Then I make another rough plan and follow that one for a while until it doesn't work anymore, either. And so on. It's a difficult and rather messy process, but I'm afraid if I outlined every step of the way and wrote exactly to the outline, my books would be less likely to come alive. And the truth is, I'm no good at outlining anyway. 7. What was your favorite book when you were twelve or so years old? This is always a question that gives me trouble. I've never had one favorite book, not at any age. I read so much and love so many books that I can never pick just one. At twelve I was probably reading books by Agatha Christie, Charlotte Bronte, Ray Bradbury, Edgar Allen Poe, Jack London...I could go on and on. 8. Do you have a consistent writing plan that you stick to every day or are your days more fluid? I schedule my time loosely rather than rigidly. My best working time is in the morning. I don't usually write for more than two or three hours a day, especially when I'm working on a first draft. That's the hardest kind of writing for me. When I'm revising, sometimes I work more hours. The rest of the day gets filled up with answering mail, reading, and doing all the things it takes to keep my life running more or less smoothly. 9. You must be excited about the City of Ember film that is coming out. Did you participate in the film making process at all? Yes, the movie is exciting--I never dreamed it would happen! I haven't had a lot to do with the process, though. I don't think most authors do, unless they happen to be very, very famous. I read the filmscript and commented on it, and I have met the director and seen a few scenes from the movie. I've also had e-mail from a few people who worked as extras on the film, so I've gotten little glimpses of what that was like. But the finished movie will be almost as much of a surprise to me as to everyone else. I'm hoping it will be fabulous! 10. Did you ever think that your books would be as successful as they are? How has their success changed your life? I did not expect this success. I'd always been a writer and had had several books of non-fiction published before The City of Ember. But Ember was my first novel, it was very hard to write, and I didn't know how it would be received at all. I had no idea that I'd be writing sequels to it, and certainly no inkling that it would be made into a movie. Because of all this, my life has indeed changed. For one thing, I've done more public speaking in the last five years than in all the rest of my life put together! I've connected with readers of all ages, all over the world. And I now get to spend my time in the place I like best--my office at home--doing the work that's more rewarding to me than anything else. 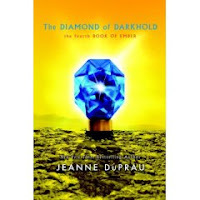 For the next three days I will be featuring a Blog Book Tour for Jeanne du Prau's new book The Diamond of Darkhold. Today you can read my review of the book. Nine months have passed since the people who once lived in the underground city of Ember made their way to the surface. The refugees from Ember are now will settled in the town of Sparks but life is far from easy. Winter is approaching and food is scarce. The Emberites are not used to cold temperatures, to thunder and rain, and to the dangers of ‘normal’ life. Sometimes a few of them even think of their life in Ember with nostalgia. One of these people is Lina. Surely her life was easier when she was living in Ember than it is now? One day a roamer comes to Sparks and Lina buys an old book from the woman for her friend Doon. Though most of the pages in the book are now missing, Doon quickly realizes that the book was left for the people of Ember to find. He is sure that the book contained instructions or directions of some kind so that the people of Ember would be equipped to deal with the world above ground when it was time for them to emerge. Doon cannot tell what the “Instructions for Use” are for, because so little information remains in the book, but he is determined to find out. Doon thinks that the instructions describe how some kind of “machine” or tool should be used, and he believes the machine - whatever it is - could very well make life in the town of Sparks a lot easier. There is only one thing that Doon can do – he has to go back to Ember to try to find more information about the book or the special tool that was left for the Emberites to use. He askes Lina to go with him, and though she is afraid of what they will find and of the journey that they have to make, Lina agrees to go with her friend. In this fourth and final title in the Books of Ember series Jeanne DuPrau takes her readers on a fascinating and exciting journey back underground to the city of Ember. All kinds of surprising events take place, and connections with the past that have been lost over the course of time are reestablished. Lina and Doon, who worked together to lead their people out of the city of Ember, have new challenges to face, and readers will be intrigued to see how these two young people face their fears and overcome the trials that they encounter. Through this book, and indeed the entire series, Jeanne DuPrau encourages her readers to think about their world and their place in it. What would it be like if there was a global nuclear war? What would we need to do to survive? If we change our outlook and behavior could be prevent such a terrible thing from happening? The other books in this series are The city of Ember, The People of Sparks, and The Prophet of Yonwood. You can find my reviews of these books on the Books of Ember page on the Through the Looking Glass Book Review website. Welcome to another Blog Book Tour. 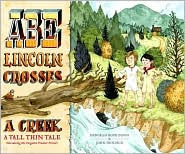 This time I am going to be talking to Deborah Hopkinson about her new book Abe Lincoln Crosses a Creek: A tall thin tale. You can read my review of this title on the Through The Looking Glass Book Review website. 1. How did you find out about this story from Abraham Lincoln’s childhood? I was very excited about the idea of writing a book about Lincoln as a boy. I scoured many of the early biographies for ideas, but some of the best ones had already been incorporated into books. Then I came across Austin Gollaher, Abe’s childhood friend who saved him from drowning. The incident is mentioned frequently but so far as I know has never been the subject of a picture book before. And so ABE LINCOLN CROSSES A CREEK was born! 2.Did you have to do a lot of research to get the few details that are known about this event? While I did a fair amount of research, finding old, rare books and looking at Lincoln research sites online, it soon became clear that there really are few details available. 3.Where did you get the idea to write the story in this wonderfully engaging style? Well, it became clear that I was actually going to have to do something different and fun to make the story interesting. I think the lack of details of the boyhood incident combined with the story of how Abe and Austin never met again but apparently remembered one another made me think about how frustrating historical research can be. As I explored that, it seemed to me a perfect way to introduce historical literacy techniques to young readers. I hope ABE prompts children to look at other historical incidents -- and rather than take them for granted, ask questions. 4. The artwork and text in the book are very closely entwined in this book. Did you and the illustrator talk about what you were going to do in advance and/or during the writing process? As a matter of fact, I had no contact with the illustrator whatsoever – but I love John Hendrix’s art. The text was developed as we envisioned the role John might play, and then editor Anne Schwartz and art director Lee Wade worked with him. Hard to believe this is his first picture book! 5. You specialize in, and are very good at, writing books about historical events and people from history. Have you always been interested in history, and how did this writing focus begin? Actually, looking back on it, I probably was always interested in history as a child, perhaps without even realizing it. I loved to read historical fiction, for example. As a young woman I became interested in women’s history. When I began writing for children I started with lots of talking animal stories, but somehow I began to gravitate toward historical fiction, even in my first published stories in magazines. 6. Do you think children should learn about the past? Absolutely! I think it’s important not simply to learn facts about the past, but also to learn the tools of research – to learn how to study and think about history. We live in a rapidly changing technological society, where historical literacy, scientific literacy, and media literacy are all linked, and will all be important to children. Learning to make sense of the past helps us to learn to think critically about the present and the messages we get from advertisers, the media, politics, and films. 7. Is there a particular time in history that you find especially interesting? Yes, indeed! I continue to be fascinated by the 19th century and have written about several aspects of it: immigration in the north (Shutting out the Sky), the cotton industry (Up Before Daybreak), the underground railroad and the Civil War (Sweet Clara and the Freedom Quilt, From Slave to Soldier), the emerging role of women in education (Maria’s Comet, A Band of Angels) and the Klondike Gold Rush (The Klondike Kid series). My middle grade novel, Into the Firestorm, takes place during the 1906 San Francisco earthquake and fire. Keep On!, a new picture book coming out in January, celebrates the 100th anniversary of the discovery of the North Pole in 1909. 8. Do you write every day or is your schedule more flexible? I have always had a full time job, so I tend to write on weekends more than daily. I would love to have more time to write! 9.What was your favorite book when you were young? When I was very young, I loved Make Way for Ducklings, and I still have the copy my grandmother gave. Later on, I’d have to say my favorite book was The Secret Garden. And it’s still a favorite! 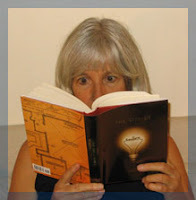 You can find out more about Deborah Hopkinson and her books on her website. Turtle Pond Publications and Scholastic, in association with Dr. Richard Leakey’s Wildlife Direct and the Desmond Tutu Peace Foundation through the catalyst of the Clinton Global Initiative, today set in motion a breakthrough campaign to help protect Africa’s endangered mountain gorillas. The campaign includes the first ever Kids Gorilla Summit, an unprecedented gathering of elementary and middle grade students, who will meet to discuss the plight of Africa’s critically endangered mountain gorillas and the release of the children’s book, Looking for Miza: The True Story of the Mountain Gorilla Family Who Rescued One of Their Own (Scholastic Press) by #1 New York Times best-selling team Craig, Isabella and Juliana Hatkoff, Dr. Paula Kahumbu and photographer Peter Greste as well as utilize a myriad of educational, web-based technological tools that will allow kids to actively participate in the mountain gorilla crisis and offer their ideas and solutions. The initiative will underscore the connection between the urgency of the wildlife preservation efforts and the humanitarian issues that are inextricably inter-related. This integrated campaign was born out of a commitment to action made at the 2007 Clinton Global Initiative shortly after last summer’s tragic massacre of ten of the world’s remaining 720 mountain gorillas, of which, 380 live in the Democratic Republic of Congo’s Virunga National Park. As part of the CGI commitment, Craig Hatkoff and daughter Juliana traveled to Rwanda with a delegation to learn first-hand more about the challenges and dynamics. The purpose of the Kids Gorilla Summit is to enlist students to become “global citizens” and make a commitment to the gorillas and the people of Africa. At the end of the Summit, all the participants are asked to sign the Kids Global Act Pact, which will reflect their commitment to taking action to make a difference. The students will share learning with their peers and continue to get involved by emailing ideas online to a designated website. The campaign also includes utilization of technology and the creation of a multi-platform, standards-based educational program that will help teach children, as well as their teachers and parents, about the critically endangered gorillas. A specially-developed curriculum and online portal, produced by Scholastic, will be distributed to approximately one million students to teach them about the gorillas, their habitat and the Mountain Rangers, and will empower them to become advocates for change. The Summit will be held in New York City on Friday, September 26 from 10 a.m. to 1 p.m. at the Scholastic Auditorium. Approximately 180 students in grades five to seven will be in attendance for an age-appropriate discussion with panelists and special guests, including famed anthropologist, Dr. Richard Leakey, founder of WildLife Direct, conservationist and author, Dr. Paula Kahumbu, Trevor Neilson of the Global Philanthropy Group and best-selling children’s author, Craig Hatkoff. First, the children will be taught about the unique challenges the gorillas and the region face. The students will be shown short videos of the gorillas, as well as special animated “Gorillasodes” that were created by students from the U.S. and Rwanda to help spread the word about the gorillas’ plight. Then, the students will be introduced to people from the region, including four reporters who are members of the Scholastic Kids Press Corps, reporting from Africa. After learning about the gorillas and the region, the students will be asked to break off into groups with an expert moderator, who will help them develop their ideas for change. Students nationwide can participate via a live national webcast at www.scholastic.com/miza and will be able to email questions to participants so they join in the Summit. In addition, www.scholastic.com/miza and www.miza.com, created jointly by Turtle Pond and Scholastic, will offer students up-to-date information on the gorillas brought from WildLife Direct’s field-based blogs written by the Mountain Rangers and other activities and resources. Students will be encouraged to share ideas about helping the gorillas. Available in bookstores nationwide, Looking for Miza: The True Story of the Mountain Gorilla Family Who Rescued One of Their Own tells the story of a baby female mountain gorilla, Miza, whose mother was one of the ten gorillas killed last summer. Miza was rescued by her father, following the tragedy and was reunited with the rest of her family. Miza almost died, but thanks to the efforts of the Congolese Mountain Rangers and Kabirizi’s family of 30 gorillas who cared for her, she has thrived. The book brings to light the gorillas’ struggle and underscores the sacrifice and heroism of the mountain rangers and their critical role in the survival of this endangered species. The book was written by the authors of the #1 New York Times best-selling Owen & Mzee series, Craig Hatkoff and daughter Isabella (9), Dr. Paula Kahumbu and photographer/journalist Peter Greste. Hatkoff's older daughter Juliana (13) also collaborated on Looking for Miza. This is the fourth inspiring nonfiction picture book written by the Hatkoffs and published by Scholastic about remarkable animals overcoming adversity. Their popular series of issues-based children’s books, including Owen and Mzee: The True Story of a Remarkable Friendship (2006), Owen and Mzee: The Language of Friendship (2007), and Knut: How One Little Polar Bear Changed the World (2007), introduces kids to real world issues and empowers them to effect change on our planet. About The Clinton Global Initiative (CGI)Established in 2005 as a project of the non-partisan William J. Clinton Foundation, the Clinton Global Initiative (CGI) convenes global leaders to devise and implement innovative solutions to some of the world’s most pressing challenges. Since 2005, CGI members have made nearly 1,000 Commitments to Action valued at upwards of $30 billion to improve more than 200 million lives in over 150 countries around the world. Through past Annual Meetings, CGI has brought together more than 80 current and former heads of state, hundreds of top CEOs and non-profit leaders, major philanthropists, and 10 of the last 16 Nobel Peace Prize laureates. Turtle Pond Publications is a private entertainment and media company based in New York. Its interests include a variety of children's publishing ventures and other media investments including the Tribeca Film Festival. 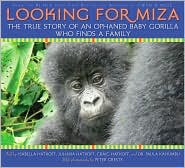 Looking for Miza: The True Story of the Mountain Gorilla Family Who Rescued One of Their Own (Scholastic Press), is the next in the series of books from Turtle Pond which depicts real life stories of animals in unique situations overcoming adversity. Wildlife Direct was started by Richard Leakey to create the world’s largest online conservation community and raise awareness and funds for conservation in some of the worlds most endangered and dangerous places. Operating deep in the jungles of eastern Congo, blogs written by rangers last year alerted the world to the crisis facing mountain gorillas in the Democratic Republic of Congo. Ranger Innocent and Ranger Diddy’s voices from the front lines of conservation on their Wildlife Direct blog provide a unique opportunity for anyone anywhere in the world to participate in the conservation of one of the world’s most charismatic and most endangered species: the mountain gorillas. Funds raised through the blogs have enabled the Congolese wildlife authority, The Congolese Nature Conservation Institute (ICCN) to continue wildlife conservation activities on the ground despite the ongoing crisis. Wildlife Direct will use Miza to raise awareness and support for mountain gorillas throughout their ranges in Congo, Rwanda and Uganda. Looking for Miza’s co-author, Dr. Paula Kahumbu, is an ecologist and Head of Conservation, Policy and Partnerships at WildlifeDirect, where she is in charge of developing conservation partnerships and establishing new blogs. Scholastic Corporation (NASDAQ: SCHL) is the world’s largest publisher and distributor of children’s books and a leader in educational technology and children’s media. Scholastic creates quality educational and entertaining materials and products for use in school and at home, including children's books, magazines, technology-based products, teacher materials, television programming, film, videos and toys. The mission of the Desmond Tutu Peace Foundation is to support and promote the creation of a culture of peace throughout the world. In the spirit of founder, Nobel Peace Laureate Archbishop Desmond Tutu, and in collaboration with the Desmond Tutu Peace Centre of South Africa, the foundation is dedicated to advancing reconciliation, peace-building, non-violence, conflict resolution, and ethical leadership so that all may live in a more peaceable and sustainable world. Global Philanthropy Group advises the world's leading philanthropists, working with high net worth individuals, charitable foundations and corporations to design and implement highly-leveraged philanthropic strategies. The group’s management expertise and proprietary network of global experts help clients achieve lasting, meaningful results. Global Philanthropy Group, lead by President Trevor Neilson, encompasses pressing global issues including economic development, education, poverty, HIV/AIDS, disaster recovery and redevelopment, refugees, microfinance, water, global health, immigration, orphans, foster care, global trade, malnutrition, climate change, green building, malaria, conservation, crimes against humanity, genocide and childhood obesity. Trevor Neilson has advised a number of the world's leading philanthropists, including Bono, Bill Gates, Angelina Jolie, Brad Pitt, Shakira, President Bill Clinton, and Sir Richard Branson, and has been involved in the creation and implementation of many of the world's most respected philanthropic initiatives. Blog Book Tour - "Two Bobbies"
For those of you who are animals lovers I have the prefect book for you. 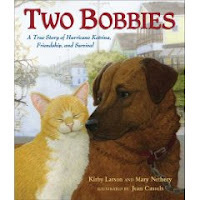 It is a true story about a cat and a dog who form a meaningful frienship and who help one another during a time of great hardship. 1. How did you take the step from hearing about the two Bobbies to writing about them? Mary and I had been looking for about six months for a story to write about unlikely animal friends. Serendipity struck when she turned on the TV one night, about six months after Hurricane Katrina, and saw a snippet about the Bobbies on Anderson Cooper 360. 2. Did you go to New Orleans to do research? If not how did you capture the atmosphere of the city in the months following the Katrina disaster? I had gone to the Gulf Coast twice – once to Pearlington, Mississippi and once to Houma, Louisiana – to help with Katrina clean-up and recovery efforts. I remember the profound silence in Pearlington, six months after the hurricane – not a bird to be heard anywhere. So we had that experience to draw on as well as input from the book’s illustrator, Jean Cassels, who lives in New Orleans and was evacuated during Katrina. 3. Did you interview some of the people who were at the shelter when the two Bobbies arrived? Our top priority was to be as accurate as humanly possible, which required much research and many interviews. We interviewed all the key volunteers at the Best Friends Animal Society temporary shelter in New Orleans, including: Barbara Williamson, who kept the two Bobbies in her motor home; Whitney Jones, the intake volunteer and Shelley Thayer, one of the pet detectives. We even spoke with the vet who cared for the Bobbies after they were adopted. We are so appreciative of the work done by the volunteers of Best Friends Animal Society that Mary and I are donating 10% of our authors’ royalities to that organization. 4. Have you met the two Bobbies? Though Mary and I didn’t get to meet them at the same time, we have both met them. They were adopted by a wonderfully generous woman, Melinda Golis, who has a ranchful of rescue animals in southern Oregon. Melinda also operates a therapeutic riding program there – Bobbie dog loves to go along on trail rides! Sadly, Bob Cat died a few weeks before the book came out but we are all comforted by the fact that he was treated like royalty in his last years. He was quite the party-cat and followed you around the house, determined not to miss a word of conversation. 5. Is it hard to write a book with someone else, and do you feel that the experience has brought you and Mary Nethery closer? collaborating so much we are now at work on a second book together! 6. You clearly have a fondness for animals. Do you have pets of your own? We’ve had several parakeets (Merlin and Tigger), a mouse (Gulliver) and a cat named Jake. Our household now has only one pet, our 18-year-old cat, Mimi. 7. Including Two Bobbies your other books are picture books, except for Hattie Big Sky which is a novel. Was it hard to write a longer book after your picture book experiences? I do have two chapter books (and two ghost-written chapter books) published so I do have some longer works out there. And, Hattie Big Sky is simply my only published novel, not the only one I’ve written. You’d find quite a hefty stack of practice novels in my files! There are challenges to writing period, no matter if the text is a picture book or a novel. I worked 10 years on my picture book, The Magic Kerchief, which has about 1400 words, and only 4 years on HBS! 8. Where did you get the idea for “Hattie Big Sky” and has its success had a big impact on your life? I got the idea for Hattie Big Sky when I learned that my great-grandmother had homesteaded by herself in eastern Montana as a young woman. I didn’t set out to write a novel but to learn more about her experiences. The more research I did, however, the more I was convinced there was a story to tell. Hattie Big Sky has received such lovely attention, including the Newbery Honor, Montana Book Award, and more than a dozen nominations for state Young Readers’ Choice awards. That is success beyond what I ever allowed myself to dream of. It’s lovely. . .and it’s hard. Writing the next novel has proved a daunting task (though, thanks to writing friends, I’m snapping out of it) and I do get uncomfortable when people fuss over me and make a big deal of the awards. I’m a pretty unremarkable person who got very, very lucky. 9. Do you write every day? My plan is always to write every day. But life doesn’t always go as planned! 10. Do you read a lot of children’s literature? Of course! It’s such wonderful, rich and engaging literature. I feel sorry for people who don’t! 11. What was your favorite book when you were a child? I read too much to remember a favorite book from my childhood. My kids and I, however, roared every time we read How Tom Beat Captain Najork and His Hired Sportsmen (written by Russell Hoban, illustrated by Quentin Blake) and Hoban’s Ming Lo Moves the Mountain was the book that inspired me, as an adult, to become a children’s book writer. For those of you who have not yet read Bonny Becker's new book, let me tell you that you are in for a treat. It is an utterly delightful picture book and I can almost guarantee that it will bring a smile to your face. You can read my review of the book on the Through the Looking Glass Book Review website. I have been lucky enough to interview Bonny this month. Here are my questions and her answers. 1.Did this story come to you out of the ether or did some person or event give you the inspiration for it? I was thinking about how things can keep coming back up in your life--you know, like the wrong type of boyfriend or the same mistake at work and how they'll keep coming back until you face that pattern and, in a way, "befriend" it. 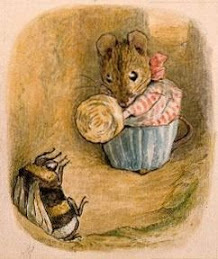 For some reason, that morphed into the image of a pesky little mouse who keeps popping up and a grouchy bear seemed the perfect one for the mouse to pester. 2. Why did you decide to use a bear and a mouse as your characters? They fit so well with the story. Mice do have a way of showing up in unexpected places. Bears are big and make good grouches. The two characters came quickly and felt just right. 3. What are you trying to say to your audience in the story? I think underneath the story, for me, is this idea about things coming up again and again in life. But as I was writing the story, I mostly was having fun with the characters and the absurdity of the situation. In my first draft, Mouse leaves and never comes back. All my critiquing friends agreed this was much too sad, so I spent another big chunk of time figuring out how to bring grouchy Bear and ebullient Mouse together in a fun, not-too-sappy way. 4. Is this your favorite book so far? I think it's a toss-up between this and my book "A Christmas Crocodile." 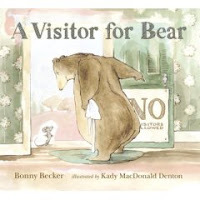 Both involve persistent, life-affirming characters and rather grumpy sorts who try to deal with them--but I have to admit, I didn't realize the similarities until after "A Visitor for Bear" was published. That theme must be one of those things that pops up again and again in my life! 5. How do you feel about all the success the book has had? I'm so happy about it. "A Christmas Crocodile" illustrated by David Small was one of my earlier books and it got a lot of attention, too, including a big review in the NY Times Review of Books. It was also read on NPR, as was "Bear" and even got read on national television. At the time, although I was thrilled, I didn't realize exactly how rare that kind of attention is. Now, almost ten years later, I do know. I'm working hard to promote and support "A Visitor for Bear" but mostly this kind of attention is out of your hands. As I told a friend, "If you swing enough, sometimes you're going to hit a home run and then, mostly all you can do is sit back and watch it fly!" 6. Judging both from this book and your website you obviously have a keen sense of humor. What makes you laugh? I am the world's cheapest laugh. My husband can attest to that--he's counting on me for a chuckle on the same old quips and I oblige. I love shows like Saturday Night Live, the Steven Colbert Report, Jon Stewart, 30 Rock, the Office. I eat up movies like "Dumb and Dumber" and "The Wedding Crashers" and Austin Powers. Dumb, stupid, broad humor--although I hate the Three Stooges. And I like clever humor--wit, satire, sarcasm and irony. I think I particularly like pompous characters. 7. I see from you website that you also edit manuscripts. Do you learn a lot from the mistakes that you see others making in their writing? 8. Can you see the mistakes in your own work? I'm better at it than I used to be. But, often, no. I totally need to get feedback. I probably do 30 or so drafts of a typical picture book. Five to six of those drafts might involve fairly significant story changes--a character eliminated, a new story event added, a different starting point, a different turning point, a different ending--that kind of thing. The other drafts are polishing, polishing, polishing. Rhythm, pacing, patterns, precise wording are critical to a picture book and that takes a lot of drafts to get just right. The polishing I'm pretty much doing on my own. But in terms of outside feedback, I probably go through about three cycles of getting feedback. 9. After writing several picture books did you enjoy writing a longer book when you did Holbrook: A Lizard’s tale? Yes. I love middle grade novels, too. And I really like being able to go back and forth between the two forms. I have a new middle grade novel, "The Magical Ms. Plum", coming out Fall '09. And a second Bear and Mouse book "A Birthday for Bear" in Fall '09, too. "A Bedtime for Bear" is coming out in 2010. And I'm working on a fourth Mouse and Bear story. And a new middle-grade novel is starting to percolate in my head. I'm letting it kind of slosh around for now, but I'm excited about getting to work on it. 10. Did you grow up in a house full of books, and what was your favorite book when you were a child? Yes. There were bookshelves in virtually every room. I think there were probably over 1,000 books, not to much the steady flow of books in and out of our house from the library. I particularly loved books about magic. Probably the Oz series was my favorite. To find out more about Bonny do visit her website. I just got back from seeing the new baby elephant at the zoo in Portland, Oregon, and let me tell you he is one of the sweetest and funniest babies I have ever seen. Of course I am partial to elephants, and I therefore leapt at the chance when I was invited to interview Carmela D'Amico who created, with her illustrator husband, the wonderful Ella the Elephant books. 1. What inspired you to make your Ella character an elephant? I tend to rely a lot on my subconscious for inspiration. Often when I'm working, I'll recline and close my eyes and just daydream for a while and simply observe whatever turns up. I had been toying with the idea of a little girl starting at a new school and figuring out what her challenges would be. One morning, I stopped to daydream and the image of an elephant popped into my mind, along with the title, "Ella the Elegant Elephant". I've always loved elephants and so does my daughter, Olivia, so it just felt right. The story took off from there. 2. What kinds of messages do you think your Ella books convey to their young readers? Because I read a lot to my daughter, who was two when I wrote the first Ella book, I noticed that many of the girl characters in picture books were sort of sassy or even snobby as a means of being entertaining. There are many exceptions, of course! But I really wanted to capture a spirit that was genuinely sweet while also being courageous and adventurous. I hope that the message of the Ella books is always one that urges children to be true to themselves but never at the expense of being unkind. 3. The Ella books describe, with a little charming embellishment, the kinds of adventures and problems any child might have. Did you incorporate your own childhood experiences and fears into the books? It's funny. I didn't used to think so until my Aunt said after reading the first Ella book, "Oh, I remember Belinda. She was so mean to you!" Well, the name of the girl who had teased me relentlessly in 1st grade was actually Brenda, but I had honestly blocked her out until my Aunt brought her up. As a child, I was very shy and kind of odd so I did get teased quite a bit, which I'm sure helped to inform the first book. I also often desired to be responsible and self-sufficient, which is a prevalent theme of the subsequent Ella books. 4. Does working with your husband on the Ella books present new challenges for you? It did at first, but less so, now, mainly because I've gained more experience with collaborating. Steve has been a designer for many years and often has to go back and forth with a client to reach a place where everyone is happy. Writing is a solitary art. I had never been in a position where I'd had to collaborate before. If he didn't like the way I'd written something, I'd tend to take it personally, which would upset him, and next thing I knew, we wouldn't be getting along and I would be wondering why. The challenge of putting on my "work hat" when doing a book with Steve was tricky for me at first, but I ended up learning a lot about him, about myself and the process of creative collaboration. 5.Do you discuss the illustrations with your husband before he begins drawing? Yes, I do. In fact, he jokingly calls me his "art director". However, once I express to him what I'd like to see happening visually, he does his own thing, which I'm normally very pleased with. 6. Are there going to be more Ella books or are you going to branch out in a new direction? We may do more Ella books; I've written another one. But, at the moment we're exploring a new character we're both excited about. 7. You have done a lot of other kinds of writing in addition to writing the Ella books. What made you want to write children’s books? I have wanted to write children's books ever since I was child. Funnily, on one of Steve and my first dates, we discussed our mutual love of children's literature. Once I had my daughter – and with my husband being an illustrator – it seemed like an avenue I simply had to explore. 8. What was your favorite picture book when you were a child, and have you shared this book with your daughter? My favorite picture book was "Thidwick the Bighearted Moose" by Dr. Seuss. No matter how many times I read it, my heart would go out to Thidwick and I'd feel such satisfaction at the end when he finally gets rid of his pesky guests. I have read it to my daughter, but she thinks it's just okay. My favorite children's book that isn't a picture book was "Charlotte's Web". Olivia learned to read by having me read that book (the unabridged version) to her, again and again, when she was four. So it balances out! 9. Are you the kind of author who carries around a notebook to scribble down ideas and thoughts as you go about your day? I sometimes feel that I should carry a notebook with me but I don't. I write every day and when I write I'm in total isolation. When I "go about my day" doing things around the house or running errands, I'm often chatting on the phone or with the people in my neighborhood. I'm pretty social for a writer. And I learn a lot from my day-to-day interactions. I should note, however, that during much of my "writing time" I'm not actually writing but pondering and scribbling notes. I'm fascinated by how every writer's process is different. 10. Do you know from the beginning how stories are going to develop and conclude, or is that something that unfolds as you work? It varies. Sometimes I think I know how a story will develop and conclude and then I'm taken by surprise when it takes off in a different direction; other times it kind of chugs along as planned. But usually I begin with a mental smattering of "snapshots" that I endeavor to arrange into a well-balanced collage. I tend to "see" the stories I will write, meaning they come to me first in pictures rather than in words. I then set out to write a story that elaborates on these scenes and links them together and gives a voice to the individual characters. 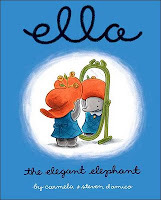 You can read my reviews of the Ella books on the Through the Looking Glass Book Review website and do visit the very lovely Ella the Elephant website as well. When I was growing up on the island of Cyprus in the Mediterranean I spent many blissful hours at the British Council Library. Being able to go to the library and to borrow books made the long hot summers bearable. Then, when I was a teenager, I worked as a library assistant, helping to manage my high school library. It was a job I was enormously proud of. Now here I am spending my life surrounded, literally, by books. Just like my younger self, I cannot imagine what life would be like without books and libraries. When I first moved to Ashland, Oregon, a year ago I was horrified to discover that the town's library was closed and had been in this lamentable state for months. The county and state just did not have the money to keep the libraries in this area open. Finally, to my great relief, the people of the town of Ashland stepped in. We were all asked if we would be willing to pay a little more in taxes so that our library could reopen. We were willing to do this and now our splendid library is up and running again. Recently I read an article about three mothers who have been trying to get the state of Washington to stop taking money away from its public school libraries. For some children, the books in their school libraries are the only ones they get to read. School libraries also provide another priceless service; they are a place where children who don't have computers at home can learn how to use the Internet. Without this resource they will leave school not knowing how to tap into the World Wide Web. To me this is a frightening thought, and I decided that I would share the story of these three courageous and determined mothers with you. You can read the complete story on School Library Journal . You can also visit the online petition to add your name to the list, and to thus show the powers-that-be that you support this cause. In addition you can visit the Washington Coalition for School Libraries & Information Technology website for more information about this story and the campaign. If you live outside Washington State you might well ask why you should care about this campaign. The way things are going these days your state might be next. With libraries and book friendly organizations like RIF losing money left, right, and center, we all need to help one another save what we hold dear. Even though this is not a bookish event, I thought I would share this information with you because it does relate to our children and I think parents, teachers, and other caregivers will find this information interesting. Peacejam is "an international education program built around leading Nobel Peace Laureates who work personally with youth to pass on the spirit, skills, and wisdom they embody. The goal of PeaceJam is to inspire a new generation of peacemakers who will transform their local communities, themselves, and the world." The organization invites young people from all over the world to join their Global Call to Action. "PeaceJam’s Global Call to Action is an international movement of young people who have decided to work together to solve the most pressing issues of our time. In small groups and clubs, in cities and in villages, Global Call to Action groups are tackling important problems facing our planet – and we are making a difference. The Call to Action comes from a group of Nobel Peace Prize laureates, men and women who have dedicated their lives to working for peace, equality, justice and a better world. These international leaders have identified ten problems that are at the root of much of the world’s suffering. Now they are asking young people to lead the way by taking action to solve these problems. Over the next ten years PeaceJam, with the support of the Nobel Peace Laureates, aims to engage young people on a massive level, working toward the creation of ONE BILLION acts of service and peace. In order to achieve this, the Global Call to Action movement extends far beyond youth and the PeaceJam Foundation itself – any group of motivated individuals from any organization, age level, and walk of life can take part. PeaceJam’s Global Call to Action doesn’t ask people to simply ‘identify’ problems or to ‘spread awareness’ of the issues. The Global Call to Action is about just that – ACTION." This is a very empowering challenge for our children, and just think how much change they could bring about if we encouraged them to participate. For young people with a creative bent who have put together a Global Call to Action project, Peacejam now invites them to participate in a Global Call to Action Video Challenge. Tell the world through film or writing about your project. Winners will get the opportunity to work in person with a Nobel Peace Prize winner. Every September 13th people all over the world celebrate the birth of Roald Dahl, one of the world's most beloved children's book authors. I myself grew up reading and re-reading his books. I remember clearly the first time I read about Henry Sugar in The Wonderful Story of Henry Sugar. I was so captivated that my father had to practically forceably remove the book from my hands so that I could eat. Because Roald Dahl's books made such a deep impression on me I have created a profile for him on Through the Lookingglass Book Review. I have also reviewedmost of his books. In addition, I have reviewed several books about Roald Dahl's life and his work. You can view these on the Roald Dahl feature page. 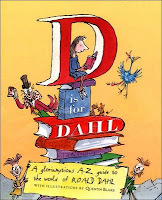 Roald Dahl fans will particularly enjoy D is for Dahl: A Gloriumptious A-Z guide to the world of Roald Dahl compiled by Wendy Cooling and illustrated by Quentin Blake. If you want some ideas on what you can do for Roald Dahl Day take a look at the Roald Dahl Day website, and if you want to find out more about Roald Dahl and his work do visit his website. Both sites have some wonderful downloads to print out and activities to try. Children's book writer Micheal Rosen, Roald Dahl's granddaughter Sophie Dahl (who is a famous fashion icon and a published children's book author) comedian Dara O'Briain, children's author and illustrator Chris Riddell and children's book writer Kaye Umansky. You can find out more about this new and exciting prize on the Booktrusted Website. Don't forget to celebrate Roald Dahl Day on September 13th. I'll have more Dahl items for you on that day. For the last few weeks hurricanes of various intensities have been hammering the Caribbean and Gulf states of the United States. Now these states are yet again having to prepare for the worst as hurricane Ike heads their way. The hurricane has already done a great deal of damage and everyone is hoping that it will not get any stronger than it is at the moment. late summer and eary fall is often a bad time for hurricanes. In 1900 Galveston, Texas, was practically flattened by a powerful hurricane on September 8th. Very few buildings were left untouched and between 6,000 and 12,000 people died. You can find out more about this tragic event on Wikipedia. Several excellent children's books have been written about this event and I have been lucky enough to be able to review two of them. Both are featured on the Through the Looking Glass Book Review website on the 1900 Galveston hurricane page. One of these titles in particular greatly moved me. In Dark Water Rising by Marian Hale we get to meet Seth, a teenage boy who has only recently moved to Galveston. Seth is just beginning to get used to his changed circumstances when the hurricane hits and everything is turned upside down. In just a few days Seth's life is changed forever. What is interesting about this book is that though it is written about a particular historic disaster, Seth's experiences and the emotional upheavals he goes through are relevant for any tragic event. People around the world who have experienced or heard about a natural disaster will immediately see that Seth's words are universal. Marian Hale has also written another superb book called The truth about sparrows, which explores the experiences that a young girl has while living in the south during the Great Depression. "I've said elsewhere that children's books belong in the general conversation about books and not in some separate little nursery. So I applied the same rule here as I did with the rest: leave out the obvious classics. Alice didn't make it, but a less well-known Arthur Ransome than Swallows and Amazons did, and so did a book that still makes me laugh after 50 years, Norman Lindsay's The Magic Pudding. Just outside my list, but pressing hard, is Philippa Pearce's wonderful Tom's Midnight Garden." In addition to The Magic Pudding, and Arthur Ransome's We didn't mean to go to sea, Pullman has chosen The Castafiore Emerald (one of the Tintin books), Complete Fairy Tales by the Brothers Grimm, the Finn Family Moomintroll, Kim, and Lavender's Blue (a collection of nursery rhymes). You can see the complete list of books on the Waterstone's Writer's Table Page. Though I have not yet read We didn't mean to go to sea. I have read (and reviewed) Swallows and Amazons. I love all the Tintin books and I must agree that The Castafiore Emerald is one of the best. I have yet to review the Tintin books for Through the Looking Glass Book Review but will do so soon. Tom's Midnight Garden is one of my favorite books of all time and I greatly enjoyed reviewing it. You might like to read the Times article written by Pullman in which he explains "how I chose my top 40." It is very well written (of course) and enormously interesting. Through the Looking Glass Book Review has a profile on Phillip Pullman as well as reviews of the His Dark Materials Trilogy and the Sally Lockhart Mysteries. The new issue of Through the Looking Glass Book Review is now online. I hope you take a moment to look at some of the individual reviews, the features, the author profiles, and the spotlights that I have put together for you. In this month's issue the special feature takes a look at titles that are about books and libraries. Books give children all kinds of opportunities, taking them on journeys around the world and into the depths of their own imagination. For many of us, libraries are not only a wonderful resource, but they are also a refuge where we can connect with others, talk about books, use a computer, and so much more. My own town recently came to really appreciate how precious a library can be when ours closed due to a lack of basic funding. Thankfully, after many months without a library, the town found a way to reopen the library doors once again. The editor's choice for this month is The Book Book by Sophie Benini Pietromarchi. This splendid non-fiction title shows readers (including adults who are interested in such things) how to create a book of their own. Beautifully and creatively illustrated throughout, this title encourages would-be writers to explore their world so that they can find what they need to create a unique book that they will treasure for years to come. The Bookish Calendar takes a look at the month of September, providing links to reviews of books that are suited to the events, celebrations, and anniversaries that fall during this month. For example September 13th is the anniversary of Roald Dahl's birth. The Bookish Calendar will take you to a wide selection of reviews about books by and about this splendid author. The Bookish Calendar also provides a link to the Titanic Page, because and on this month in 1985 the wreck of the Titanic as discovered off the coast of Newfoundland lying at the bottom of the Atlantic Ocean. During our visit to the website don't forget to check out the Book Giveaway Page. Three titles are up for grabs this month.